Firstly, the airport. We had heard bad reports about the queues etc. but this is the quickest we've ever been through an airport. The luggage was off the plane almost immediately. We were then taken by private taxi to the botel which only took 10 mins. Going home, because we had booked Thomson a la carte, again we had a private taxi and at the airport, a rep took us to our check-in desk and we were checked in straight away. Corfu Town - do not expect the town to be like other smaller Greek or Cypriot tourist areas. There is no beach and therefore no water sports. There is not karoke bars or english/irish bars, no kids entertainment areas and no activities such as mini golf. None of the tavernas/bars that we were in had entertainment. We found that most of the restaurants around the Liston area are very similar with quite small portions and ranged from about 40 to 65 euros for two courses with wine. They are also very noisy with mopeds zooming around. The two best restaurants we ate in were the Il Gardino Italian which is in the next street to the hotel and the Poco Loco Mexican which is in Solomon Street, close to the entrace of the New Fort. The portions in both were massive compared to the Greek restaurants and much better value - between 40 and 55 euro and better service. The cocktails in the Liston area are too expensive - 10 euro for a Long Island Iced Tea compared to 5 euro for the same cocktail in the Mexican. Corfu town is a maze of streets -the hotel provides good maps at reception to get you around. The shopping areas get very busy and have weird opening hours - best to ask the rep or at reception. We had intended to hire a car but the traffic and the driving is just downright dangerous and we were not brave enough. The Thomson reps were very good at the airport and we didn't need the rep at the hotel. 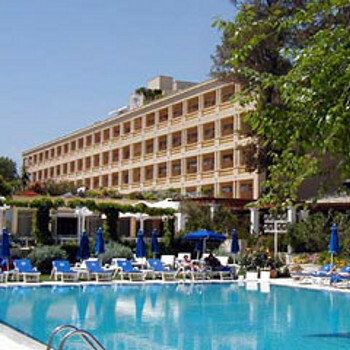 Although we had no complaints about the Corfu Palace Hotel (apart from the pricey water) and would stay there again, I don't think we would spend another two weeks in Corfu town.